I live in the beautiful San Jacinto Valley in Hemet, California. My artistic style is what I call "Modern Fusion" ... I love to draw inspiration from the past ... and "morph" it into a beautiful work of heart ... rich and alive in brilliant color and subtle hues. I love to take the wisdom of ALL peoples elders, and combine traditional with modern ... old with new ... fusion!!! Nature. Beauty. Texture. Color. Eloquent words. The sand beneath my feet, the wind blowing through my hair. The wrinkles on an older person's face. Waves of the ocean. Rain. Rainbows ... All creatures great and small, Native American's long braids--woven with pride. Beautiful, old buildings. Fire and Ice ... The world. My favorite materials to work with are seed beads--shiny, satiny, pearly, rainbowy, glossy, tiny ... all of them! I also love the sparkle of Swarovski crystals, the natural patterns of gemstones polished to display their perfection. I submitted Turquoise Pathways in 2011. I was SO proud that my barrette was chosen as The Silver Medal prize winner in the 2011 contest featuring gemstones! This was my first entry and my first "win" in such a large and prestigious contest. I immediately felt the inner "need" to challenge myself to attempt to create a "masterpiece" for Fire Mountains next year's contest, and began working on Sacred Fire, which I proudly submitted for the 2012 Seed Bead contest. Turquoise Pathways was inspired by the beautiful piece of turquoise. I wove meandering paths around it to create links between our past and our future ... between the wisdom of our elders and the dreams of our children. Sacred Fire was inspired by Laura Mears beautiful Indian Warrior, and Indian Maiden. I enveloped these beautiful cabochons, each in an individual blue blanket, symbolizing their individual sorrows, before they "Unite as One" at "The Sacred Fire." One the couple are married, they discard their individual blankets for a wedding blanket, which is white, with a red stripe woven thru it, to remind them to "always follow the good red road." It created itself ... I was simply the tool that helped it come together. About 5 years ago, I began helping my son make his Native American regalia, and the beadwork for it. I made medallions, loom work, purses, a beaded tie, barrettes ... but I still had the desire to broaden my knowledge ... I knew there was "more" out there for me! At a local bead store, I found, but could not afford, a beautiful Laura Mears Indian Maiden. That beautiful piece "hooked" me. I KNEW I had to find a way to be able to afford this beautiful Indian Maiden, and surround her with beauty. But I left her be, at the store ... waiting for the day she could come home with me. While at the same store, a dear friend generously bought me a beautiful piece of turquoise ... so shiny ... so "different" ... I excititedly took it home ... and thought "ok now ... how do I do this?" I looked further and further into the internet ... started beading cautiously but bravely around my beautiful turquoise ... Adding in beautiful "ivory" here ... "coral" there ... pathways meandering around and around my beautiful piece ... sewing and weaving in textures and colors ... and Turquoise Pathways was finally born! I KNEW this could be the "start of something big," And so it was!!! Once I won my silver medal in 2011, my confidence level rose immensely! I "surfed the net" more and more, seeking inspiration and knowledge from many fantastic jewelry designers. I found much inspiration in all the wonderful photos of jewelry on the Fire Mountain website. I bravely entered--AND WON--several other bead store contests ... and, with my "winnings," I was finally able to bring Laura's precious Indian Maiden and warrior home with me, and began creating Sacred Fire . With every contest that I win, I try to use my "winnings" to further broaden and expand my beading "stash," and my ever growing repertoire of techniques. I challenge myself to try for more and more creativity, and to perfect my techniques, as well as create new ones! I am very honored to have been accepted into "The Battle Of The Beadsmith" 2013. This is a worldwide event, which can be followed on Facebook, which was created by Steven Weiss, "In an effort to create more awareness of some of the incredible bead artistry being executed by bead masters worldwide, I thought it would be fun to set up a beading "tournament" where original works can be viewed, shared, and celebrated both by the participants, and the beading public alike." I feel honored to now be included in the category of "bead master!" Many, many moons ago, I sat lovingly on my father's knee carefully weaving beaded rings, bracelets, necklaces and if I was REALLY lucky, perhaps decorations for a pair of moccasins, which he helped me make from his left-over buckskin. Many moons passed since those childhood days. My son, Byron, then began learning to make beadwork for his Northern Traditional Regalia, and he taught me to help him! He showed me how to do double needle appliqué, lazy stitch, how to improve my childhood attempts at loomwork, and how to make my colors "POP!" I am honored that my son and I can now share our passion for beadwork together! Well, yes and no! Some things are created naturally, where others are formally cultivated. I have NO "formal" training or education in "art." My degrees are in Nursing Oncology and Cardiac Care, but my artistic soul was created by the Great Creator Himself, and nurtured by my entire family. My Dad made his own "Mountain Man" regalia and replica guns and cannons. My Mom loved to draw, paint, do macramé, make candles and sew. My sister loved to draw, paint, sew and spent many thankless hours helping us younger children make a "creative mess!" My oldest brother loved to design and build model airplanes. My younger brother also made his Native American regalia for Boy Scouts presentations ... and then came ME!!! So, my background as an artist comes from constantly being surrounded by my multi-talented family ... that always believed that "A creative mess is better than idle tidiness!" I discovered Fire Mountain Gems and Beads, in a roundabout way, through Jody Young, one of their award winning artists. I had been inspired by her beautiful, textured, sparkly and creative beading ... where did she get her supplies for such beautiful textures? I love almost anything that involves COLOR!!! Sewing, quilting, painting ... can't draw to save my soul! I can paint it all pretty, but I can't draw it! Not yet--I want to!!! The area I live in is rather "rural." Other than the fantastic internet, my only bead supply sources are Michael's or Joanne's--talk about basic! I am a few hours away from groups right now; maybe I should start one!!! Jewelry making is my passion! I lie in bed at night waiting to get up so I can "bead." My mind goes into overdrive sometimes "I want to make this" ... "I want to make that" ... I see an old, raggedy piece of wood and think "I need to bead that" ... I look at soap bubbles in my sinkful of dirty dishes ... and think "Look at the iridescent colors! Purple! ... Blue! ... Pink ... Crystally! ... " ... so round ... so much texture ... so overflowing with bubbliness! I'm an addict--I admit it. Is that Step One? I am so excited that I was able to open my shop, RebeccasWell, on Etsy. Here is the link to it, if you would like to see some more of my work. I feature unique and unusual pieces, in a variety of styles and colors. Check back in frequently, as I am always adding new pieces! I can also be contacted at Seemecreate4u@hotmail.com for custom orders. I want to! I have always believed in "giving back" as much as possible. I have made quilts for "Quilts for Kids" and donated my LONG hair to Locks of Love. 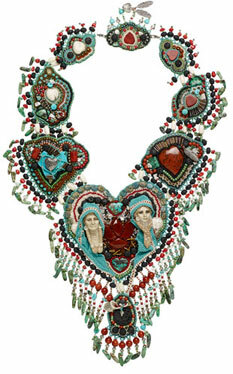 Now, to find a venue to donate through beadwork! Don't just look AT something--look INTO its depths! Feel it's soul ... its warmth ... its heartbeat ... then express that inner core of beauty and life creatively; then make it POP!!! "Creatively is not being afraid to make mistakes--Art is knowing which ones to keep!!!" CREATE!! !